It is usually limited to the pelvic area. It involves parts of the reproductive organs. It should be corrective in nature, not destructive or extirpatory. Organs and their parts are removed only if absolutely necessary. Once removed they cannot be replaced. Surgery should be as atraumatic as possible. The organs must be handled gently and with care. Many abnormalities caused by various diseases can be successfully corrected by an experienced surgeon, thus accomplishing two goals simultaneously: treating the disease and enabling a patient to conceive one or more children the "old-fashioned" way, without the need of In Vitro Fertilization or GIFT. If done improperly, however, surgery could make the underlying problem worse. It is important that an operating microscope and special instrumentations are used to work with utmost care and precision. Surgery can be used to diagnose and treat anatomical problems or in technologies that bypass those problems. Surgical procedures for women include diagnostic hysteroscopy, diagnostic laparoscopy, tubal reversal, assisted reproductive technology procedures (GIFT and ZIFT), and reconstructive pelvic surgery. Highly trained and experienced doctors can often use minimally-invasive surgery instead of abdominal surgery to minimize pain, scarring, and recuperation time. Procedures for men, usually performed by a urologist, include vasectomy reversal, removal of obstructions, sperm aspiration, and varicocele repair. Several surgical procedures can help you improve your chances for pregnancy. Abdominal surgery was the traditional way to gain access to the internal pelvic organs. Now, most procedures can be done using laparoscopy or hysteroscopy. These less-invasive procedures minimize scarring and recovery time as well as complications. Your doctor may use a hysteroscopy for diagnosis if your ultrasound exam suggests problems inside the uterus or gives incomplete information. A hysteroscopy allows your doctor to examine the uterus for scar tissue, polyps, or fibroids. A telescope-like device is passed through the cervix. Hysteroscopy requires no incision, and patients usually recover quickly. If any problems are found, your doctor may be able to correct them during the initial hysteroscopy. Follow-up may be necessary with a separate operative hysteroscopy or other surgical procedure. With a few small incisions, your doctor can see inside your abdomen to the outside of the uterus, the fallopian tubes, the ovaries, and the bladder. A viewing device (the laparoscope) is passed through one of the incisions. The laparoscope can help your doctor diagnose uterine fibroids (in the wall of or outside the uterus), endometriosis, ovarian cysts, and other fertility problems. These problems can often be treated during the laparoscopy. In some cases, follow-up surgery may be required. Most women recover within a few days. The small incisions are normally made at the navel and at the pubic hair line and rarely leave noticeable marks. Some women who choose sterilization for contraception later wish to become pregnant. A new marriage, other life change, or a new outlook may prompt this change of heart. Tubal ligation, a "permanent sterilization" procedure, can be reversed. In other cases of female sterilization, IVF is usually the best option. In tubal reversal, the surgeon uses laparoscopy or abdominal surgery to repair the tubes. It is an outpatient procedure. Scar tissue is removed, the ends of each tube are prepared, and the tube is reconnected with tiny sutures. Since the fallopian tubes are extremely delicate, success - and future fertility - depend on the ability of the surgeon. After a successful reversal, you will have up to a 75 percent chance of pregnancy. In some cases, your doctor may recommend an assisted reproductive technology that requires surgery. For example, your cervix may be scarred in a way that prevents success with standard embryo transfer after IVF. Your doctor may use a laparoscopy to place the embryos or a sperm/egg mix into your fallopian tubes. 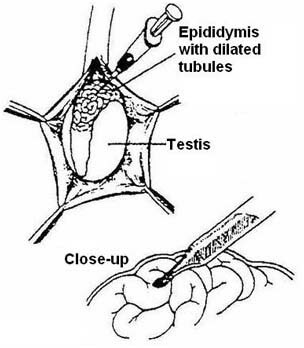 In ZIFT (zygote intrafallopian transfer) the doctor places embryos into one of the tubes. In GIFT (gamete intrafallopian transfer). the unfertilized eggs and sperm are transferred into a tube. Recovery normally takes a week or less. Some women are born with an improperly developed uterus. These problems occur naturally in a small percentage of women, and some of them lead to infertility or miscarriage. Surgery may correct them. When a female fetus develops, the two sides of her uterus begin to form, then fuse together from the bottom up. Sometimes, they don't fuse, resulting in an abnormal cervix or a closed-off portion of the uterus, called a blind horn. For women born with this condition, menstrual fluid can't get out of the blind horn and pregnancy rates are lower. A laparoscopy or hysteroscopy can be used to remove the blind horn or open it up to the uterus so that it can function normally. Sometimes a dense layer of tissue grows and divides the uterus into two working halves. These women have decreased pregnancy rates and higher miscarriage rates. 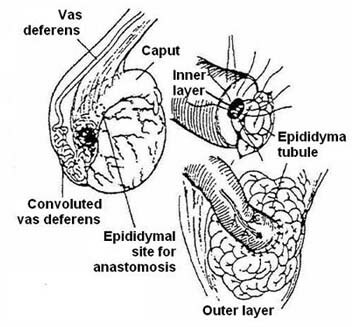 An operative hysteroscopy can sometimes be used to remove the dividing layer. Some men don't produce sperm in their ejaculate. This condition, azoospermia, can be caused by a vasectomy, a natural obstruction that traps the sperm, or improper sperm development. In some cases, outpatient surgery can help these men become fathers. The urologist makes a small opening in the scrotum. The obstruction is found, scar tissue is removed, and the ends of the tubes are open and reconnected. The procedure usually takes about three hours. You may be sore for several weeks. If pregnancy doesn't occur within a few months, you may wish to pursue further fertility treatment. Some obstructions that trap sperm can also be surgically corrected. For non-operable obstructions or failed vasectomy reversals, the urologist can use sperm aspiration. The urologist locates the obstruction, then uses a small needle to draw out sperm from near the obstruction. If sperm aren't found, the next step is to take a small sample of testicular tissue (a testicular sperm biopsy), which may contain sperm. The sperm can be used immediately - or frozen - for an IVF cycle. In IVF with ICSI (intracytoplasmic sperm injection), only one sperm is needed for each egg. If you don't produce any mature sperm (a condition called nonobstructive azoospermia), a testicular sperm biopsy may help. 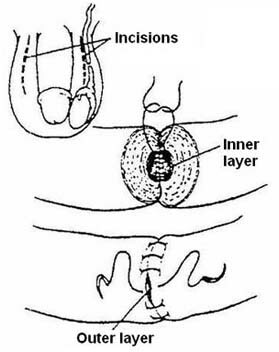 A small needle puncture is used to remove a tiny portion of the testicular tissue. The sperm are then dissected out of the tissue. If insufficient sperm are found in the small sample, a larger biopsy may be performed. Almost all men have some sperm. Since IVF with ICSI requires only one sperm for each egg, most of these men have enough sperm to have a genetic child. Pregnancy rates may be lower than for men with obstructive azoospermia. This is becoming a less-used procedure. It is believed that an enlarged vein - essentially a varicose vein - around a testicle can raise its temperature, thus suppressing sperm count. 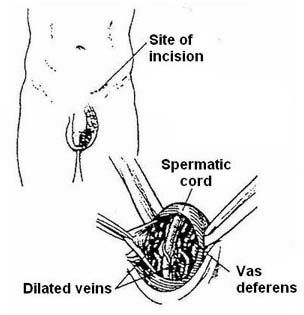 In varicocele repair, the urologist ties off the vein. After surgery, sperm count usually increases within a few months, but pregnancy rates don't seem to improve. Those which can be treated by medication. Those which can be corrected only by a surgical procedure.